"Lowcountry" redirects here. For the geographical region in and around the Netherlands, see Low Countries. A scenic vista from an observation area at Hunting Island State Park near Beaufort. Such marsh views are emblematic of the Lowcountry and its landscapes. 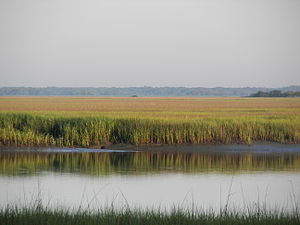 The Lowcountry (sometimes Low Country or just low country) is a geographic and cultural region along South Carolina's coast, including the Sea Islands. Once known for its slave-based agricultural wealth in rice and indigo dye, often referred to as indigo, that flourished in the hot subtropical climate, the Lowcountry today is known for its historic cities and communities, natural environment, cultural heritage, and tourism industry. 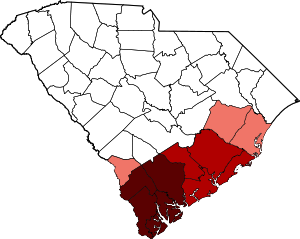 The term "Low Country" originally was all the state below the Fall Line, or the Sandhills which run the width of the state from Aiken County to Chesterfield County. These Sandhills were the ancient sea coast. The area above the Sandhills was known as "Upstate" or "Upcountry". These areas are different in geology, geography, and culture. There are several variations on the geographic extent of the Lowcountry area. The most commonly accepted definition includes the counties of Beaufort, Colleton, Hampton, and Jasper. These four are covered by the Lowcountry Council of Governments, a regional governmental entity charged with regional and transportation planning,  and are the ones included in the South Carolina Department of Parks, Recreation, and Tourism's "Lowcountry and Resort Islands" area. The area includes the Hilton Head Island-Bluffton-Beaufort, SC Metropolitan Statistical Area. One of the most distinctive elements of the South Carolina and Georgia Lowcountry is the architecture. Lowcountry style home architecture developed in the late 1700s and is still constructed today as the most efficient design for the hot subtropical climate of the southeast United States. Originally dependent on plantation agriculture based on indigo, rice and cotton, the Lowcountry economy developed other sectors in the 20th century. 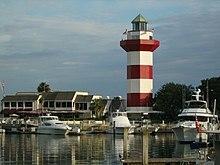 Hilton Head Island is one of the most popular resort destinations in the United States. Tourism dominates the economy in much of the Lowcountry. Among the attractions are resorts, historic and cultural sites, and natural features, including Hunting Island State Park, Edisto State Park and other local, state, and federally protected or preserved lands and wetlands. The area offers many destinations for golf, tennis, and beach vacations on Hilton Head Island, Fripp Island, Seabrook Island, Kiawah Island, and the Wild Dunes portion of the Isle of Palms. Hilton Head's Sea Pines Plantation was an early resort in the 1950s. Longstanding seaside communities, including Edisto Beach, Folly Beach, Sullivan's Island, and the Isle of Palms remain popular destinations for visitors and a growing number of permanent residents and second-home owners. Charleston attracts millions of visitors each year. Beaufort offers cultural activities and sightseeing, while some of the smaller communities in the region have certain cultural activities or amenities that attract thousands of visitors per year. Highway or traveler commercial services are of particular importance to communities in the Lowcountry (including Mount Pleasant, North Charleston, Goose Creek, Charleston and Summerville) and along Interstate 95 (including St. George, Walterboro, and Hardeeville). The Port of Charleston has several shipping terminals. Much of the Lowcountry's economy revolves around manufacturing, transportation, logistics and other port-related business. The Port of Charleston, owned and operated by the South Carolina State Ports Authority (SCSPA), is one of the ten busiest U.S. ports and handles over $60 billion in goods each year. Major shippers include Maersk, Hapag-Lloyd, Evergreen Marine Corporation, COSCO and Hamburg Süd. 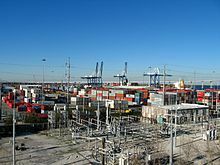 The SCSPA is building a terminal at the old Naval Base in North Charleston, South Carolina, and has plans to build a new ocean terminal port in southern Jasper County by 2020, in conjunction with the Georgia Ports Authority under a bi-state commission. A port facility in Port Royal closed in 2005. Information technology companies in Charleston and Berkeley Counties include Blackbaud, a software company headquartered in Charleston that employs hundreds of workers at its Daniel Island facility. North Charleston has the region's largest volume of retail sales. Specialty retail, including arts and crafts, souvenirs, and antiques is big in the historic areas of Charleston, Summerville, Beaufort, Port Royal and Walterboro. The Piggly Wiggly Carolina Co. has its local headquarters in Charleston with major warehousing and distribution center located just past Summerville off I-26. Major shopping complexes in the area include the Citadel Mall in Charleston, the Northwoods Mall, Tanger Factory Outlets and Centre Point in North Charleston and Tanger Factory Outlets in Bluffton, the Mount Pleasant Town Centre in Mount Pleasant, and Shelter Cove Towne Centre on Hilton Head Island. Major shopping districts in the area include the City Market and King Street in Charleston, Savannah Highway in West Ashley (Charleston suburb), Daniel Island (Charleston suburb), North Charleston, Johnny Dodds Boulevard in Mount Pleasant, Boundary Street and Bay Street in Beaufort, and U.S. 278 in Bluffton and Hilton Head Island. St. George, Walterboro, Point South, Ridgeland, and Hardeeville provide motorist services along Interstate 95. Marine recruits on the Chosin Range, located at the Marine Corps Recruit Depot Parris Island. Tens of thousands of active duty and reserve military personnel are stationed in and near Lowcountry bases, including Air Force, Navy, and Marine Corps facilities. The South Carolina National Guard has several outposts located here as well. Military facilities in the Lowcountry include the Space and Naval Warfare Systems Center in Goose Creek/Hanahan, the Charleston Air Force Base in North Charleston, and the Naval Weapons Station Charleston in Goose Creek, which includes a Naval Consolidated Brig in Hanahan. A former naval yard was closed in 1995. Facilities in and near Beaufort include the Marine Corps Recruit Depot on Parris Island, the U.S. Naval Hospital in Port Royal, and the Marine Corps Air Station in Beaufort. Grits is one of several staples of Lowcountry cuisine. The region's culture has Southern, Native American, European, Caribbean, and African roots. Among the more notable are the Gullah influence on St. Helena Island, the early European settlements near Beaufort and Port Royal, and the Caribbean influence on architecture in Charleston. Charleston and Beaufort have dozens of ante- and postbellum homes, with unique blends and styles of architecture. The South Carolina Artisans Center is located in Walterboro. ^ Lowcountry Council of Governments Archived 2015-09-05 at the Wayback Machine official website. ^ Tourism Regions (map) at South Carolina Department of Parks, Recreation, and Tourism official website. ^ "Boeing Move Could Spread Across State". The Greenville News. October 29, 2009 – via Newspapers.com. Bopp, Suzanne. "Road Trip: Low Country, South Carolina and Georgia". National Geographic. Retrieved December 28, 2012.